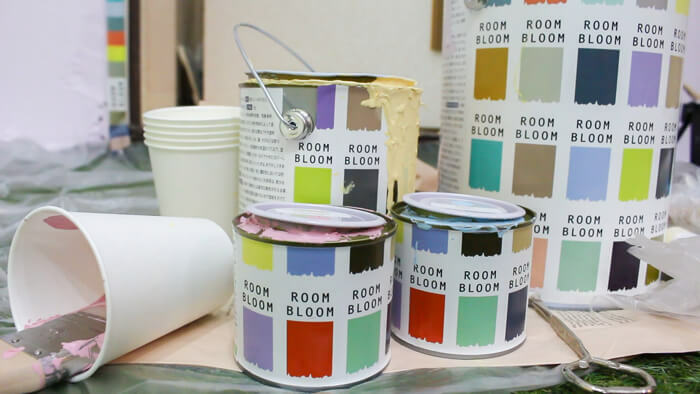 On March 24th for MOSHI MOSHI NIPPON FESTIVAL 2018 in SHIBUYA, Japanese paint company ROOMBLOOM held the Happy Wall Project which they have been doing since 2014, an activity that contributes to society. The Happy Wall Project is a volunteer project based on the idea of enrichening one’s life even more through painting. 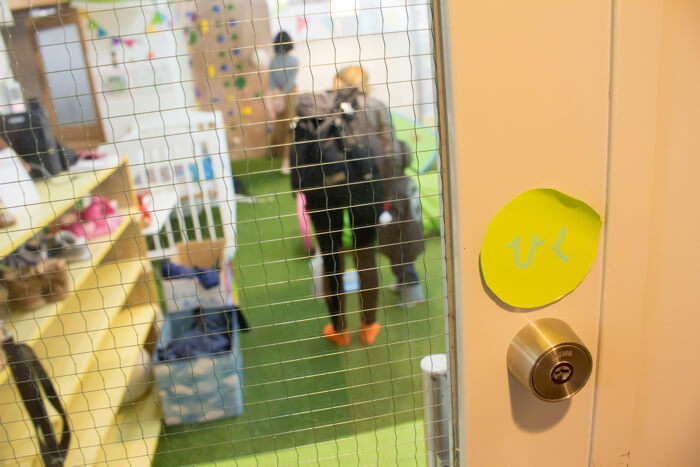 The first run was held at Hiratsuka Children’s Center and has since made its way to 21 educational facilities and welfare institutions across Japan. 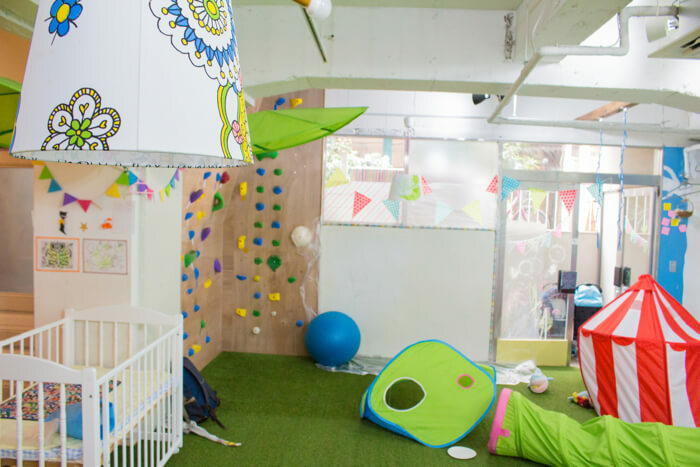 With backing from Shibuya City and the Shibuya Tourism Association, ASOBISYSTEM, who produce the MOSHI MOSHI NIPPON FESTIVAL, held the Happy Wall Project as a workshop for children at Mirai∞LABO KIDS, a daycare facility located on Cat Street in Ura-Harajuku, to promote the growth and prosperity of Shibuya and Harajuku. On the day, enrolled students and graduates of Mirai∞LABO KIDS worked with children with Down’s syndrome and autism who are members of the painting group atelier A as well as people associated with Nippon Paint Holdings to create a picture book amongst other arty things. Natsume Mito also received approval to get involved. 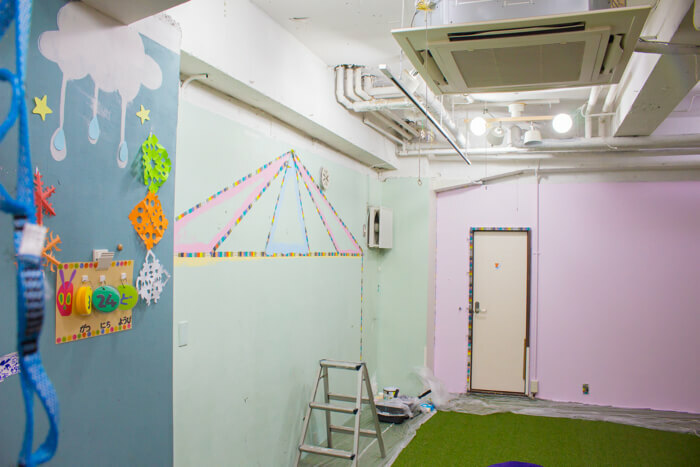 The project they worked on was painting 3 of the walls at Mirai∞LABO KIDS. They didn’t use monochromatic colours for the biggest wall – they painted a circus tent. This is the symbol of the institution. Circus members have an unbroken fighting spirit. They challenge themselves to things other people don’t. These are all indispensable elements children must possess. There’s a hope in the center to one day give birth to someone who will go on to work in the circus after leaving. Natsume Mito spoke with the children to decide on what paints to use for the colour scheme of the circus tent. Instead of strong, darker colours, they decided to go with lighter pastel colours so that the children can feel calm. It was quite a challenge however as there were 189 paints to choose from. For the circus tent they chose “Birthday Present” pink, “ALOHA!” light blue, and “Grass Hopper” green. For the sides of the wall they used “Little Kiss” cherry blossom colour. The colour names were all unique and exciting. The smaller children began painting first. There were children who had fun using their hands instead of paint brushes to put hand prints on the wall. Smaller details and parts of the painting that were higher up were left to the older children. People of all ages worked together and helped each other out, and after about an hour, the paint project was completed. When it came to snack time to wait for the paint to dry, Natsume Mito played hide and seek with the kids. A sense of connectedness through working together rang through the room. It was a warm atmosphere, and the laughing never stopped. After tearing off the masking tape the painting was complete. The adult guardians who watched over the work applauded everyone for their admirable efforts. The daycare center was now bright thanks to the paint job. And a picture of a new circus tent was now in the room. The children will likely never forget about the place they helped decorate. ▼Check out this video which captures footage from the day. 16,000 People Attend MOSHI MOSHI NIPPON FESTIVAL 2018 in SHIBUYA!